BEST VALUE PACK FOR TOTAL CAR PROTECTION This 4 pack of two car seat protector mats and two kick mats is the best value on the market and gives you complete protection to keep your car clean and organized. Buy the pack to protect your entire car or split up the set between two family cars so you're always protected and organized no matter what car your child is in! Why pay the same amount for just two mats when you can get a complete set? If your back seats are constantly getting dirty, muddy and scratched up then look no further! 2 CAR SEAT PROTECTOR MATS - Non slip back keeps the mats in place - An extra tab that wedges in between the seat back and seat to keep them from slipping - Heavy duty material and thick padding hold up to the roughest wear and tear - Installed in less than a minute - Two mesh pockets at the bottom corral mess and keeps items off the floor. The pockets give mom, dad or a child easy access to frequently used items. 2 KICK MATS FOR BACK SEAT PROTECTION If your child is always leaving shoe scuff marks on the back of your front seats? Do you constantly have toys, games, baby gear and other miscellaneous stuff rolling around the floor of your car? 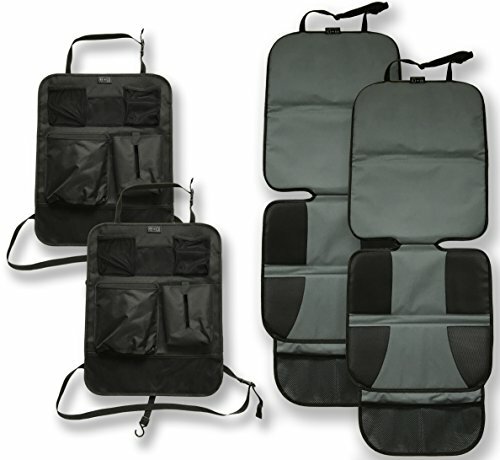 These kick mats offer protection for the back of your seats as well as organization for your back seat. Now you don't need to spend any more money or time on cleaning your car all the time. - XL size mats the cover the ENTIRE surface of your seat backs - Five pockets for storing items - One pocket is specifically designed for easy access to tissues or baby wipes but can be used for other items as well - Installs in 30 seconds with easy adjustable buckles - Water-resistant, machine-washable fabric for easy care 100% Satisfaction Guarantee or Your Money Back! THE COMPLETE CAR PROTECTION SET: If you have kids or pets in your car this is your total car protection package that will keep your car clean and looking new. The set comes with two car seat protector mats and two kick mat car back seat protectors and organizers that are durable, water-resistant and easy to wipe clean. EASY TO INSTALL: This car protector mat set is easy to install and fits all cars. Car Seat Protector Mat: An adjustable strap that goes around the headrest and an additional tab slips between the seat back and seat to secure the mat. Kick Mats: Adjustable top and bottom straps that remain hidden and out of the way so the front seat passenger and driver don't feel them. 2 THICK PADDED CAR SEAT PROTECTORS: Heavy duty construction and thick padding offer the best protection for your car upholstery against car seats and pets. Non-slip backing keep the mats in place and an adjustable strap makes installing easy. An additional tab slips between seat back and seat to secure the mat. 2 FIVE-POCKET XL KICK MAT ORGANIZER: Keep your car organized and clean with these water resistant, machine washable and easily wipeable kick mats. Their XL size protect your entire seat back. A baby wipe pocket and four additional pockets keep clutter under control and organize toys, baby gear, crayons and games for kids in the back. BEST QUALITY & SATISFACTION GUARANTEED: These are top quality mats made from thick and durable material that will keep your car protected from the heaviest car seat and dirtiest feet. It's the best value pack offered and gives you total protection for your car. We guarantee satisfaction and promise to make any issue right. If you have any questions about this product by Emma + Ollie, contact us by completing and submitting the form below. If you are looking for a specif part number, please include it with your message.